Thank you to Jenny for taking the minutes of the last meeting, which were agreed and signed. Letter re. Gutters - Caroline has received a reply from Salma Dad, who said that she will raise the need for repairs with PRP. She also thanked Caroline for bringing the matter to her attention. Caroline said that she has heard that PRP will keep responsibility for maintenance of the library building at present and will chase the gutter repairs up if necessary. Jenny Lockwood expressed concern about the length of time it is taking to repair the broken window in the library door. Louise said that she has been told that it will be repaired tomorrow. Class Visits - Caroline and Jenny L met with two teachers from Honley Junior School at the Library. It was agreed that eight classes will visit on rotation for ½ hour sessions on Tuesday, Wednesday and Fridays. Jenny L. said that we must ensure that Louise has enough support, with extra volunteers if necessary. Children without a library card will be given a form to take home to complete so that one can be issued. If a child does not have a card or form, they will still be able to take a book out on the class card. FOHL Leaflet/Bookmark – We have produced and purchased 500 of each, although we have extra bookmarks due to an error in the way the first batch were cut. We discussed where they should be distributed, including the Village Hall and Parish Rooms, Library and placing a copy in the village notice board. Jenny L said that she would take some to St Mary's Church and Caroline will take some to the Civic Society. A huge thank you to Jenny B for designing and organising the printing. Jenny said that she would send a card to Sharon Gaunt at the Printer's for all the support which she gave. FOHL Bags – Stephen Dufton has had 100 paper bags printed with the FOHL website; cost £25. Jenny B. said that she had done some costings for a rubber stamp of the FOHL logo, with a view to printing it on to cloth bags. The cost would be £50 - £60. No decision has been agreed on this at present. Flower Tubs – The Village Trust had money left over from their original grant, which enabled them, together with the Civic Society, to re-plant the tubs outside the Library and around the village. It is not clear what will happen in the future but it would probably be possible for FOHL to pay for replacement plants if necessary. Margaret said that the Society had done a litter pick around the Library last Sunday. Photo Protocol – Mark has clarified that we do not need to follow the protocol for adult pictures, only for those including children. Nita asked if we need written confirmation of this decision and Joe said that he would ask Mark for this. It was agreed that, before we take photos at events, we will tell everyone where the photos will be published and ask if they are okay with this. Scrutiny Meeting Update - Caroline said that the Cabinet had approved the proposals, except for two small amendments; Mirfield Library has now two hours less and Birstall Library has been given two hours more. The 'Christmas Readaround' was a great success due to the fantastic performance by '8 in a Bar', whose attendance had been secured by Anne Broadbent; not an easy task at this time of year given their full diary of commitments. Anne organised the programme for the night and was supported by the Events Team and other 'Friends', including Linda Sharpe who took responsibility for publicity; Jenny Bagworth who designed the posters and Nita Steel who organised the public poetry readings on the night. The singers donated a signed copy of their CD for one of the raffle prizes. Other prizes were donated by 'Mustard and Punch', 'Stylish Thoughts' and Nita, who provided a bottle of wine. Further copies of the CD were available to buy on the evening. The next 'Events' meeting will be arranged in February. The Christmas Tree Festival in Trinity Church went very well. There was good liaison between FOHL and the Knit and Natter Group to decorate our tree, which looked excellent. All the decorations were appropriate, either knitted or based on a book theme. The knitted snowman, reading a book brought the display together. A huge thank you to Caroline, who provided the tree; Joyce Hobson, who was our link person with the Knit and Natter Group; all the people who knitted decorations and the nativity scene; Nita, Margaret W, Linda S, Liz and Caroline, who made the book themed decorations and everyone who helped to assemble, decorate and dismantle the tree. Free refreshments, consisting of tea, coffee, juice and biscuits -. Jenny B and Margaret W to purchase. Bran Tub - Nita to rewrap presents as majority in Christmas paper. Jenny L will ask Val Javin to do the press release as she used to be Deputy Editor of the Examiner. Jenny L will also make an announcement at St Mary's Church and Caroline will do the same at Trinity Church. Everyone to arrive early at 9.00a.m to set up. Nita, Karl and Joe to help move the books from Jenny's garage. In addition we will distribute Leaflets, Bookmarks, Printed bags and promote and give information about Library Volunteers. The counter in Honley Library will shortly be replaced by a new 'pod' which will have a larger work surface and will incorporate a lower part for wheelchair users. Joe said that the balance in YBS is £416.70 and he has £18.49 in Petty Cash after paying for the leaflets, bags etc. Full details are available as necessary. Facebook and Twitter are now linked up to the FOHL website. Linda S said that she would put information on these sites about the 'Santa Story Time' event at the Library. The Group needs to meet to discuss whether it might be better to put agendas and minutes on the website in PDF format. It was agreed to meet at the Gallery Cafe at 10.00am on Monday 14th December. A meeting was held for volunteers on Wednesday 25th November and 13 people attended. Mark said that the Library will continue to open 28 hours a week until further notice, however a process is being followed to address staffing, volunteers, the buildings and opening hours across all Libraries in Kirklees. All changes will need to be implemented before 31st January 2017. Honley has a strong team of volunteers (18 plus some in training) who are covering 16 hours per week at present. Mark said that we need to increase the coverage of volunteers to 28 hours, therefore more volunteers will be needed to cover the additional hours. Carrie and Femi offered to be Volunteer Coordinators and will work with Mark to build on what is working, relieve Mark of some of the more operational volunteer work and look at the issue of availability for the additional hours. Carrie and Femi will also have a 'back-up' person. There was a discussion around the volunteer application form, which some people thought might be 'off-putting' to potential volunteers. Caroline suggested that this should be discussed when we meet with Salma. There is a Social Evening for Volunteers at Honley Library on Wednesday 9th December. It was agreed that Joe will purchase 12 mugs and 12 glasses, 24 teaspoons, a sugar basin and milk jug for the library. Apologies:; Pat Thompson; Pat Colling; Cllr Edgar Holroyd-Doveton ; Parish Cllr. Stephen Baggott; Jason McCartney M.P. The Chair advised that the meeting would need to keep to the agenda and not go into too much detail in order to keep the meeting to a reasonable time limit. The minutes of the last meeting were agreed and signed. Joe and Caroline attended this event and had prepared a handout which explained what fundraising FOHL had done and how it had been done. The event went well. Denby Dale had given a very good but lengthy presentation although it was not appropriate for some of the participants as Denby Dale are in a different position to most 'Friends' Groups. They have the money for the new build. Carol Stump had sent an appreciative email to Caroline for the work done and attendance at the event. 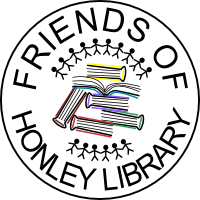 The Deputy Head of Honley Junior School is meeting with Louise, Mark, Tiffany, Caroline and Jenny L tomorrow at 4.30 at the Library to discuss regular class visits to the Library for three year groups. Jenny B produced the latest draft of this and feedback was favourable. Caroline offered a suggestion to add organisations to the About Us section. Jenny will forward the leaflet to Joe and subject to minor changes it will go to the printer shortly. Arrangements will be made to visit the printer to discuss options for the bookmark. Jenny will contact them and advise Joe, Caroline and Linda of result. It was agreed that we would order 500 of each. Charles suggested we put the leaflets out to villages nearby such as Netherton, Thurstonland, Farnley Tyas, Brockholes, Hinchliffes and maybe New Mill. FOHL Bags Steve had investigated and although he can source linen bags for 99p each the printing would bring the cost up to £4. He had therefore looked into paper bags and clear labels with our web address on it. The font and position of the web address were discussed and Steve was asked to proceed with this using the positioning and font agreed on. The cost of the bags was £24 for 100 plus the labels. Jenny B wondered if for the future we use an ink stamp and fabric ink on linen bags and will investigate the cost of such a stamp. and it was agreed that Caroline would raise this issue with Mark and Salma. Other issues regarding this topic would be dealt with under Scrutiny. Flower Tubs These have been replanted. Margaret attended a meeting and has sent an email regarding the tubs but has not had a response. It is thought that the tubs have been replanted by 'Honley in Bloom' and that in the absence of replies to emails or other information we would just be thankful that they had been done. Mark was circulating an email about this and it was agreed that it was part of his remit at the moment. Caroline had attended the Scrutiny meeting at the request of Salma. The meeting had lasted from 9.30 to 4.15 but was very interesting. 2. There was an unclear definition of the difference between Town Libraries and Community Supported Libraries. There was discontent from some libraries regarding how many hours and staff time they had been given so these issues were under further consideration by the Cabinet. Charles advised that there was room for manoeuvrability. Results are unlikely to be known before Christmas. The Examiner had produced a good write up on this subject. The town libraries consisted of 7 in North Kirklees and Holmfirth but it was unclear how these had been defined. Salma had sent Caroline an appreciative email for attending and speaking, in which Salma commented on "how well you have all worked with us". Joe outlined how he saw FOHL operating by having a friends meeting every month and it was to this group where the sub groups would report back. It is mainly the same people who were involved in all groups. With regard the Development Group it had ceased due to loss of participants and it manufactured tasks which were not completed. Caroline and Joe have performed the development function and agreed to continue in this vein. Anne said that initially the Events Group was set up to organise the quarterly readarounds but this had escalated and more events had been arranged. It was agreed that the Events Group would have a break in January and meet again in February to discuss what events would be planned and individual FOHL members would need to say what they were prepared to do. Existing plans for events would be carried through and the Events Group would oversee all events not just the quarterly readarounds. Charles advised that the most important issues for the 'Friends' to do were to keep up the number of volunteers to work in the library and to get people through the doors. Mark's information had been circulated and had been interpreted in slightly different ways. Joe, Anne and Linda would try and meet with Mark to clarify what action we needed to take at our events and how to work the library camera. Caroline, Mike and Joe would put the tree up between 9.30 and 10.00 on Wed 2nd December and then it can be decorated until 11.30 or on Thursday morning or Friday between 9.00 and 6.00. We would need to use the side entrance when going to put the decorations up. Karen Stannard was the link person. FOHL had met with the Knot and Natter group and lots of decorations had been made. This group know about the setting up arrangements. It was agree to meet with them again on 23rd November. The trees would need to be taken down on December 6th between 4.00 and 6.00. Offers of help to take it down would be appreciated. The decorations could then be used in the library. It was agreed that this was a great collaborative event. It was agreed that we would only have one book token. The two metres of bunting would consist of our leaflets and possibly bags and if there were any decorations left over from the Christmas Tree Festival they could possibly be used. The weather would also be a factor to consider when setting up the stall. Jenny L had issued a detailed plan for the day and it was agreed that the price of books would be reduced at lunchtime. Jenny L has also sorted all the books she has into categories and they are all in her garage. The books collected at Book Group on Wednesday would also be sorted and used on the stall first and books would be needed by 30th November. As Jenny L lived so near to the stall we could restock the stall from her garage. Her friend will make a cloth banner for the stall and we will be able to use this for future events. The limit of prizes for the bran tub would be 50. Pat T has the paper for the tub. YBS are no longer able to print posters for us. We were all thank ful for the help they had given us in the past. The posters for the readaround had been printed and there would be a small cost. Hopefully we can find another organisation to print the posters for us. Joe reported that there was £476,70 in the bank and £30.48 in cash totalling £517.18. There would be costs for the leaflets and bookmarks, paperbags and labels to be paid in due course. Linda asked if there was anything else to go in the Honley Flyer which is distributed about the end of November. At the moment she has the Readaround, Tree Festival, Street Market. No other items were mentioned for inclusion. Joe and Caroline had been to see the deeds of the library and met with Gary Fowler [Chartered Surveyor]. They were small deeds and comprised of 11 or 12 documents. There was no mention of constraints on the use of the building. Gary had said that legal experts had looked at all deeds of all buildings owned by Kirklees. This fact was reassuring in that two different sources had looked into the deeds. The documents dated back to 1867. Gary reads all documents from the Cabinet and the Council. Gary has the responsibility for selling buildings and at the moment there is no policy to sell the library building although following a discussion with Gary it appears that Kirklees have no money to maintain the buildings and therefore at some point in the future decisions will need to be made about its future. The next and final step would be to go to the Land Registry. This can be a difficult process but will be made easier because Gary has provided the reference number. It will cost about £5. Gary was asked why it had taken so long to see the deeds and he apologised for the delay but it was purely because they are so overwhelmed with work at present. Previously refuse had been left in the garden at the rear of the building. The Village Trust have removed this and FOHL would like to thank them for all their hard work to make the library look so good. They are coming back to paint the railings. Thanks are also due to The Civic Society and cards will be sent to both organisations. We need more hits on the site so that it comes up on Google. Joe suggested a website group but this could be discussed in the future. A thank you card will be sent to Jon. Joe thanked those who had done the training. Joe and Caroline would liaise and send the thank you cards. The money from Kirklees is still outstanding and Joe has filled in the necessary forms. Joe has spent some time with Lisa who will support him with the Treasurer role. We would like to thank Lisa Curry for this help and support. Jenny Lockwood had a bill for £20 for the stall booking at the Christmas Street Market. Joe will get £30 out to pay this and top up the Petty Cash amount. The next event to produce money for FOH will be the Christmas one. Joe asked if those who provided refreshments for events were reimbursed and the answer to this was that claims were not made except for paper disposables. This is something to be reviewed in the new year. Nita informed the meeting that we would meet at 6.15 to prepare for the Julia Deakin event. Posters had been distributed. Julia has also had quite a few posters. Concern was raised that people might turn up on the night without a ticket and we may have to turn people away. It was agreed that the posters for the December event would say 'Entrance by ticket only'. Christmas Market Please bring good as new paperbacks to the Reading Group or FOHL meeting in November. Jenny Lockwood will be taking the lead on this event and has advised that the public liability insurance is not now needed. She has also agreed with the library that we can have discard books for the stall. Helpers will be needed for the time slots 9.00-11.00,11.00-1.00 and 1.00-3.30. This will be organised at the Events Meeting on 12th October. Other ways of creating interest at this stall were considered and a bran tub was suggested. Margaret and Nita would arrange this. We also hope to have book marks and a range of publicity materials available. Leaflet This is work in progress and a draft will be produced at the next meeting. Photo of the library[ for the website]. Pat has done this and Jon will change it. Letter to Councillor Turner and the Examiner. Caroline produce a letter that had been sent and was thanked for all her efforts and for doing such an excellent job. Margaret will attend the next meeting and is trying to find out if we can have 2 tubs to put outside the library and fill with bulbs and winter flowers. It is not clear who all the tubs belong to but it is thought that the 4 tubs currently outside the building belong to the Council and will be removed shortly. Sylvi from the Village Trust has previously provided planters for the railings at her own expense. Involving more people in activities and meetings Pat has sent an email to all FOHL. Nita said that she had spoken to people who would be excellent at being involved but are put off by the concern about taking the building on. It was agreed that once the decision had been made about the library we would organise a get together with coffee and biscuits on a Saturday afternoon to get as many people together as possible and try and get across to people about what FOHL were prepared to do and what they are not prepared to do and try to change opinions. It was also agreed that Linda and Jenny would organise a coffee morning in the spring for the Mayor's Charity -Diabetes UK. Funding sources Pat kindly agreed to hold information about funding sources . Jenny L would also have contacts that she could hopefully pass on to Pat. Photo of Suzanne Caroline had given people the opportunity to give their preference of the photo to be put in the library. The final decision was made for Caroline to ask Steve to get photo 5 printed 6"x 8 and FOHL would get a frame. The scheme is going well and there are now 18 volunteers and 2 in training. Mark has a target of 25 . The coordination of volunteers is going well and Mark is happy to put the rotas up each month. The difficulty at the moment is if we need to change our slot or there is a space not filled we need to reply to all by email and change the rota in person or phone Louise and ask her to do it. If volunteers just respond to an email someone else could go to the rota in the library and not be aware that someone else had agreed to fill a slot. Evening Readers Group – Joe said that the next book would be Wuthering Heights and if we heard of anyone who couldn't make the day time Reading Group please let them know about the evening group.. Thank you to Jenny B. for taking the minutes of the last meeting, which were agreed and signed. Flower tubs: Caroline has had a message from Carol Ripley, Chairperson of the Civic Society, regarding the possibility of having two tubs of winter bulbs and flowers outside the Library when the Council remove the existing ones. Carol said that she would raise the question at their meeting, being held tonight. Margaret W is attending the meeting. Joe has bought 'Thank You' cards to send to the Civic Society and the Village Trust. Photo of Suzanne: Stephen has printed the photograph of Suzanne, which Anne has framed and it is now on display in the Library. Land Registry: It was agreed that no further action regarding this will be taken at present. Letter to Graham Turner: Following publication of the letter in the Examiner, Caroline has received appreciative emails from Carol Stump and Mark Redman on behalf of Library Services. Events Group Feedback: Anne was unable to attend the meeting due to illness but her report was presented by Linda S.
'An Audience with Julia Deakin' event on 22nd September was another successful and enjoyable evening, having 37 guests. Julia is a gifted poet and gave excellent readings of her poems followed by a Q&A session. She also had copies of her books for sale, which she signed. Julia declined a fee and instead the Friends made a donation of £42 to her favoured charity 'The Shannon Trust Reading Plan – by prisoners for prisoners.' We hope to invite a speaker from the Trust to come along to talk to us about it later in the year. This was another great team effort, thank you to all the Events team and helpers. Next event: Tuesday 1st December from 7.00 – 9.00p.m. Christmas RAR featuring '8-In-A-Bar' (all members of Honley Male Voice Choir). This will be a ticket only event, priced at £2 per ticket. '8-In-A-Bar' will be performing at the start of the evening and, after festive refreshments, we'll be having audience readings. This will be a brilliant end to another year of events to be proud of – well done to ALL. The next Events meeting is on Monday 19th October at 7 p.m. at Honley library. All welcome. 9.00 – 10.30; 10.30 – 12; 12 – 1.30; 1.30 – 3.30. Nita said that she could help to set the stall up and clear up at the end of the day. Linda S. agreed to bring her bunting for the stall and there is also a short length of bunting at the library. On the stall there will be FOHL leaflets, bookmarks (Jenny B) and badges; a Bran Tub for children (Nita and Margaret) Christmas Cards (Jenny L) 'Guess the book page' (Jenny L). We will also have books for sale, priced at 50p for hardback novels and 20p for paperbacks. 'Coffee Table' books will be priced individually. The Library has also agreed that we can have some discard books, which we will sell for 10p. Contributions of books for sale or small gifts for the Bran Tub may be brought to the Reading Group on Wednesday 11th November or left at the Library throughout November. We will also need a supply of carrier bags. Stephen Dufton offered to source a supplier of canvas shopping bags, which could be printed with the FOHL logo. These could be sold on the Christmas stall and afterwards in the Library. All details will be finalised at the Events meeting. Christmas Tree Festival at Trinity Church: Caroline said that we have been invited to decorate a tree. The 'Knit and Natter' Group are knitting ornaments to decorate a tree and Louise agreed to ask them if they wanted to share with FOHL. Various ideas for decorations were put forward, including bookmarks, library cards, volunteer badges and Liz suggested making mini books out of matchboxes etc. It was also suggested that we could have a 'craft afternoon' at the library to make the decorations. Caroline said that we could borrow her 5ft Christmas tree, which can be put up on Friday 4th December between 9am and 6pm and taken down on Sunday 6th December between 4pm and 6pm. There will be a number of workshops, including one on fundraising presented by Caroline and Joe. Friends of Beaumont Park, together with Kirklees and Huddersfield Literary Festival are hosting a Poetry Competition. It is open to all age groups and is based on various themes, with the common theme being Beaumont Park. Winning Poems will be announced in March 2016 as part of the Literary Festival and will be published in a booklet to be sold. The most exciting part of the project is that the winning poems will then form a poetry trail around the Park on plaques at various locations. We hope to get a poster and more details shortly. Honley Library will remain a Kirklees building and running costs will be covered by Library Services at the present time. However, opening hours will reduce to 15 hours per week from April 2016 and Cllr Baggott warned that if volunteer hours fall below 25% of library opening hours, then it is likely that the library will close. Visits to Honley Schools: Caroline has visited Honley High School and has spoken to the person who organises work experience placements and volunteer opportunities, to promote work in the Library. She will arrange to visit the Junior School later this month and Jenny agreed to go with her. Website: Linda has updatedthe Events section of the website and Pat will update the Agendas and Minutes sections later this week. We discussed forming a small group of people who would have the ability to edit the site. Stephen Dufton said that he would be willing to join a website group. If anyone else is interested, please contact Joe or Pat. We also discussed the need for a Facebook account and perhaps also a Twitter account to attract more young people. Linda said that she does put details of FOHL events on her own Facebook page but it would be better to have our own page linked to the website. Joe said that he would contact Jon to discuss this and would also remind him to change the photo of the library on the website. FOHL Leaflet and Bookmark: Jenny B and Linda S have done a lot of work in putting together a draft leaflet and a bookmark. There was a discussion around minor points but all agreed thatthey had done an excellent job. Jenny should receive information about costs from the publisher tomorrow and will let Joe know. Joe said that it might be possible to apply for a grant to cover the costs if necessary. Thank you very much to Jenny and Linda for their excellent work. Joe said that he has paid out £20 for the Christmas Market stall and has received £48 from the Julia Deakin event. The cash balance is now £30.48 and we have £376.70 in the bank. We are still owed £100 from Kirklees for providing refreshments for the Community Event. Joe said that he would chase this up again. The Library Volunteer rota system is working well and all sessions have been covered. It was proposed that we should have a Christmas get-together for the volunteers, which will be discussed at the Events meeting. No other matters were raised and the meeting closed at 7.30pm. Food Bank Volunteers – At the Food Bank Volunteers (HV) meeting on 11th June 2015, it was agreed that we would no longer distribute food bags from Honley Library due to the lack of take-up of the service. The FBV(HV) will continue to have their meetings at Honley Library and will contact FOHL if they believe that there is a need to resume the service in the future. Thank you to everyone who gave their support to this service. Joe reported that the audit has now been completed by Leslie Chadwick, who teaches accountancy. It was agreed that Joe would send a letter of thanks, a bottle of wine and two tickets for our next event to Leslie. Joe said that he had declined Lisa's offer of support with the Treasurer's role as it is difficult for her to attend meetings. He is happy to continue with the role at present. Anne reported that the talk by Peter Marshall on 'Formidable Women in Honley's History on 8th June had been very successful, with 40 people attending. Peter's talk was very interesting and we made a total of £106.00 on the night. We had two guests of honour at the event, Stephen and Amelia Dufton, who brought along the Citizen's Community Award, which they received on behalf of our previous Chair, Suzanne, for all the work that she had done for the library. Stephen has kindly left the Award for display in the library. Our 9th Readaround, 'Poetry, Verses, Prose' on Tuesday 28th July was devoted to audience readings only. Despite it being in the holiday period, 20 people attended. Honley Pet and Hardware Store donated a voucher and the Co-op donated two bunches of flowers for Raffle prizes. It was a very enjoyable and informal evening and a total of £45.50 was raised for our funds. Tuesday 22nd September from 7.30 – 9.00pm. 'An Audience with Julia Deakin'. Julia is a widely acclaimed poet, who has had three books published and has featured on 'Poetry Please'. Alison Brackenbury says that she is 'Bold, irreverent and wickedly funny'. Tickets will be on sale at the library in 2-3 weeks. Tuesday 1st December from 7.00 – 9.00pm. 'Christmas Readaround'. As usual, we will be inviting the audience to read poems and there will be a special musical addition, together with our usual festive delights. This will be a ticket only event, so please make sure to book early. The next Events Group meeting is on Monday 10th August at 12 noon, upstairs at the Gallery Cafe. At the meeting with Jane Brady and Carol Stump on 9th June we expressed concern that Salma Dadd had intimated that Honley would become a Community Run Library. Carol gave reassurance that no decisions had yet been made and stressed that they had heard loud and clear that the FOHL have gone as far as possible with their support of the Library. She went on to say that there is no point in saying that Honley would be a Community Run Library as it would be setting us up to fail. 'Carnegie' funding for the setting up of Honley Library was discussed and it would seem that there was no stipulation that the building should remain a Library and there is no restricted covenant. However, in giving the Library, Andrew Carnegie obviously hoped that the Local Authority would continue to provide these facilities for the community. Since the meeting, Caroline has contacted the Freedom of Information people, asking them to provide the deeds of the Library for our inspection. She has communicated with them approximately every 10 days, despite their claim to give information within 20 days of first enquiry. After her last letter, Caroline received a letter (dated 30th July) apologising for their lack of response and giving a named contact and telephone number, so she chased the application up once again. She will give them a week to reply and then try again if necessary. Stephen Baggot suggested that Caroline could complain to the FOI Commissioner if she was still unsuccessful. The Library Consultation Report is now on the Kirklees Website. A short discussion on this followed. Anne felt that the statement that 59% of respondents wanted Community Supported Libraries was very misleading. However, in the context that this was in response to the three options set out in the Consultation, it is quite positive. A Networking Meeting was held on 27th June at the Town Hall for 'Friends' Groups. Joe, Anne, Nita and Margaret W. Attended. Presentations were give by Carol Stump, Chief Librarian; Graham Turner, Cllr for Resources in the Cabinet and other Kirklees Officers who have responsibility for Community Development, Income Generation etc. Joe took some notes, which were circulated and discussed. Apparently, the Government has promised to provide WiFi in every Library and there will be an announcement locally in the next few weeks, presumably when a decision has been made about the Kirklees Library Service. Graham Turner said that they were reviewing the use and potential of all Council owned buildings but this was a massive task. Salma put forward Honley Library as a good example of the use of volunteers and mentioned our present model of co-ordinating the rota. Council Meeting on 29th July. Thanks were given by all present to Caroline, who gave a presentation regarding the work of FOHL and our aspirations for the future. All Councillors present were 100% in favour of maintaining libraries and there was also a lot of support for current library buildings. Three other 'Friends' Groups also gave presentations but David Sheard commented that the issue was not just about these four Libraries but included all Libraries in Kirklees. Cllr Palfreyman warned that it would become competitive and that some libraries would not find it easy to find volunteers. There may need to be special arrangements, particularly for deprived areas. The Cabinet will now discuss what they have heard, together with the Library Consultation and reports from Jane Brady and Carol Stump. The provisional date for the Cabinet Meeting is 22nd September, with a decision expected by the end of September if all Councillors agree. If not, the issue will be sent to the Scrutiny Panel. We now have approximately 20 volunteers who have been trained to work alongside a member of staff in the library and we are at present covering 15 hours out of 27 hours opening times. The rota system is working well, even during the holiday period, with people signing up for whatever hours they are able to cover each month. Evening Readers Group – Joe said that the next meeting will be on Thursday 13th August. Group members are now selecting the book to read, rather than leaving it up to him. FOHL Web Site – Our Web site is now up and running, although we still need to have some training on keeping it up to date and providing links to Council Reports etc. This should happen in the next couple of weeks. Why not have a look and let us know what you think. Go to www.friendsofhonleylibrary.org.uk and access it through Attracta Business Directory. Linda Sharpe volunteered to attend the training so that she can update Events etc. Joe, Caroline and Pat also said that they would attend. If anyone else is interested, please let us know. Honley in Bloom – the Civic Society and Village Trust arranged to re-paint the railings in front of the Library and the Council provided flower tubs in preparation for this event. Caroline, as a representative of FOHL, went on the tour of the village with the inspector, whose report will be published in September. Since the inspection, the working party has done more work in tidying up the grounds at the back of the library and will also re-paint the railings there. The whole library site looks much better but Caroline said that there is still a lot of garden rubbish to remove. This will probably be done by Caroline and Mike, making a number of trips to the refuse site or perhaps borrowing a trailer. There was some discussion about FOHL providing permanent flower tubs for the front of the library when the Council remove those that are currently in place. Everyone was in agreement with this. Community Grants Award Afternoon – As previously mentioned, Charles approached FOHL about providing and serving refreshments during the afternoon at Stoney Lane Community Centre. We were paid £100 for this service. Kirklees Rural District Committee made £2000 available for local projects. Projects taking part had information stalls and discussed their work with attendees, who were then given four votes which they could award to their favourite projects. At the end of the afternoon, £500 each was awarded to the four projects who had received the most votes, which were, 'Holmfirth Wildlife Rescue'; 'Meltham Brass Band'; 'Burhouse Court', for sports equipment; and 'Believe' which is a group set up by pupils at Honley High School to support young people in setting and achieving their goals.